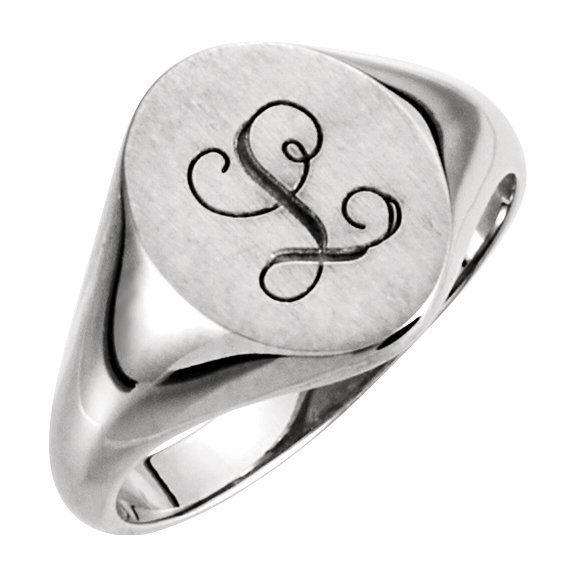 Fancy script design is available if you choose a custom engraving on this silver black script custom signet ring from Apples of Gold Jewelry. The ring, which is crafted in a .925 sterling silver, has highly polished sides and a band, while the top of the ring features a satin brush finish that is perfect for the optional engraving if you choose it. The oval on the top of the ring measures 10mm by 8mm in size, perfect for adding a script like engraving of a single letter or a three letter monogram. We guarantee our Silver Black Script Custom Signet Ring to be high quality, authentic jewelry, as described above.